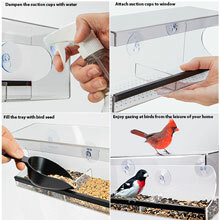 Feed and watch local birds from the comfort of your home. 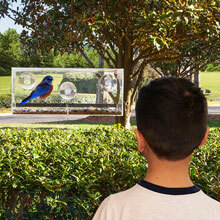 Constructed from see through plastic so that you can closely watch beautiful songbirds in just inches away from your eyes. 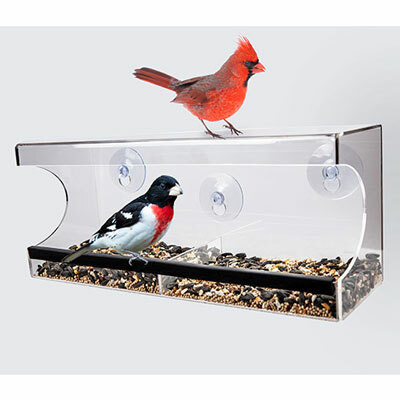 Attract a wide variety of birds including finches, juncos, chickadees, nuthatches, titmice, cardinals, sparrows, jays, cardinals and more. 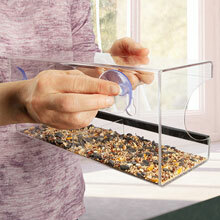 Dual trays provide the ability to fill this unique window bird feeder with multiple types of seed. A padded perch encourages grip, while a solid roof helps keep out the elements. 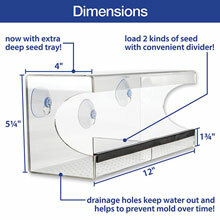 Drain holes in the bottom of the trays prevent mold and help keep the see dry. A great gift idea for parents, nature lovers and children. Even pets will enjoy watching birds visit and feed. 11¾" wide, 4" deep, 5" high. 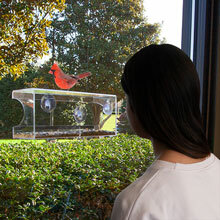 •PRACTICAL DESIGN: Enjoy the beauty of nature without needing binoculars, this bird feeder is designed to attract the birds right to your window, made out of high grade transparent plastic, you can study and appreciate the different bird species from the comfort of your home, kitchen, office or bedroom. •EASY INSTILLATION AND CLEANING: Heavy duty suction cups adhere strongly and easily to any smooth clean surface, to clean simply take down and hand wash, drain holes in both the trays prevent mold growth, while the covering helps keep the seed dry. •PREMIUM QUALITY: Durable plastic is strong yet lightweight, quality grade suction cups keep the feeder mounted & affixed firmly on your window or any smooth surface, dual trays holds 4 cups of bird seed to reduce the frequency of needing to refill and tray divider offer the ability to offer multiple types of bird food. 11¾" wide, 4" deep, 5" high. •PROVIDES HOURS OF ENTERTAINMENT: A great way to teach your children about nature and birds, keep your cat entertained throughout the day or help your elderly parents or grandparents feel closer to nature, this window bird feeder is perfect for all ages. •GREAT GIFT FOR: Bird watchers, house warming, gardeners, students, elderly, children, nature lovers or yourself. 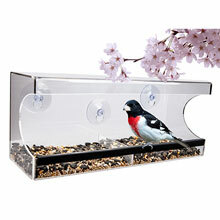 It will definitely become a favorite gift that bring nature right outside their window.